Looking to put an Asian twist on salmon? 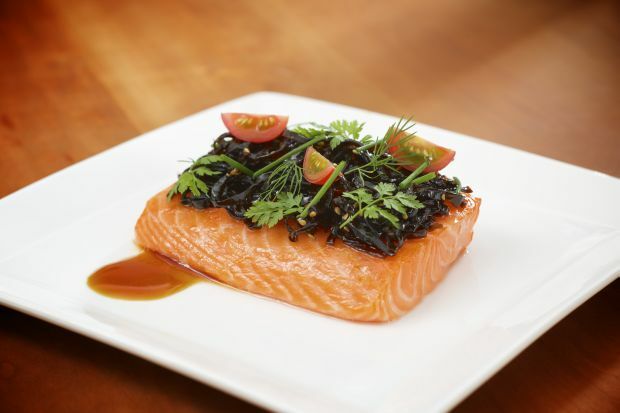 Here’s a slow-cooked Salmon with konbu, soy glaze and mixed herbs. This recipe is courtesy of Chef Jimmy Chok, who is with the Norwegian Seafood Council. Make soy glaze by heating soy, mirin and sugar together, add corn flour to thicken. Rub salmon with olive oil and place on a tray. Set oven at 55 degrees Celcius and cook the salmon for about 45 minutes. Drizzle soy glaze over fish and top with konbu. Finally, garnish with herbs and cherry tomato.